All proceeds go towards the children of Learning Links. 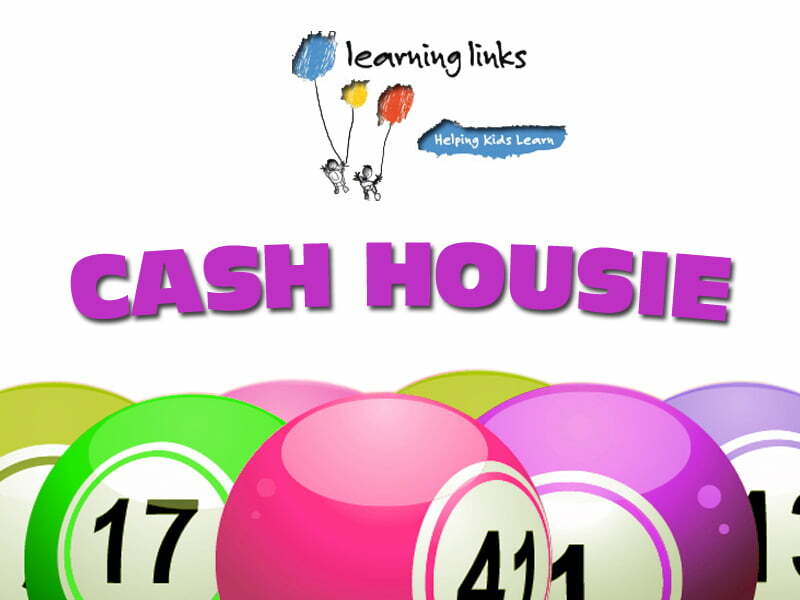 Charity Housie is also called Cash Housie, and is similar to Bingo. It is played with electronic or printed tickets bearing numbered squares. A Housie Caller selects numbers at random which are then announced to the players. Each player marks off the numbers on their ticket as they are called. A player wins if they are able to mark off all the numbers on their ticket first. This is called a full house. The main difference to Bingo is that in Charity Housie prizes can be cash, whereas in Bingo prizes can only be non-cash. Charity Housie prizes can range from less than $100 to $4,000. In Australia, Charity Housie can only be conducted for the purpose of raising money for a charity. The benefiting charity must receive at least 12.5% of the proceeds raised from the sale of the Housie books. Charity Housie has many regular and devoted players who enjoy it as a social outing as well as the chance of winning. 1. Charity Housie prizes are calculated on the basis of sales and limited to a maximum of 75% of the gross proceeds of a Housie session. 2. Of the gross proceeds, the benefiting charity must receive at least 12.5% as profit and expenses cannot exceed 12.5%. 3. Charity Housie tickets have a maximum cost of $0.40 per ticket per game. 4. Game prizes are subject to no single prize exceeding $150 in an ordinary game. 5. The maximum combined total value of jackpot prizes awarded in a major Housie session cannot exceed $2,000. 6. Any prize awarded over $2,000 will be paid by crossed cheque or by means of electronic transfer of funds to an account nominated by the prize winner. 7. Housie venues are all non-smoking venues. 8. There must be a minimum of 30 minutes break between Charity Housie and Club Bingo sessions. 9. Patrons can purchase a combined maximum in paper and electronic tickets of 48 tickets per game. 1. During a session the session permit, the permit conditions and the financial statements can be viewed at the sales desk. 2. It is the responsibility of each player to check that they have the correct books and change before leaving the sales table, no responsibility will be taken once they have left. 3. No jackpot books or sheets will be sold after the caller announces “final call” for sales. 4. Players must be playing the correct book and card colour with the correct serial number or they will not be paid a prize. 5. Once the Caller has called a game closed, no other cards will be accepted as winning cards, if there is more than one winner the prize will be shared equally. 6. If you call Bingo on a winning number that was called prior to the last number called and someone else goes out on the last number called, the prize will be shared equally. 7. A number is not fully called until the number has been repeated, if a number is called by mistake and repeated, that number will then be classed as called. 8. If a number is lit up on the board and is missed by the Caller, that number will only be accepted as a valid number if it is called and repeated by the Caller before the end of that game and providing the Bingo machine is not faulty. 9. Learning Links reserves the right to alter progressive jackpots at any time. 10. In the cases where a computer is not in use for checking a winning card and that card is unreadable due to dark colours being used for marking the card, that card will be disqualified and no prize will be paid. 11. Where children are permitted to play Housie, they must remain seated with their accompanying adult at all times and if they win, the prize will only be paid to an accompanying adult. 12. Any disruptions during Housie are not acceptable and the person or persons involved may be asked to leave. 13. All mobile phones must be put on silent mode or switched off while games are being played. 14. Players are allowed to reserve tables up to 20 minutes prior to Housie starting. 15. Learning Links’ employees are not allowed to participate in playing the game whilst on duty. 16. The Session Supervisor will have the final say on any disputes arising during a session. 17. If you have any queries regarding the manner in which we run our sessions, please contact Learning Links’ Head Office on (02) 8568 8218. The children and families of Learning Links thank you for your support.